Adamjee Cantonment Public School Class 1 Admission Notice & Lottery Result 2017. 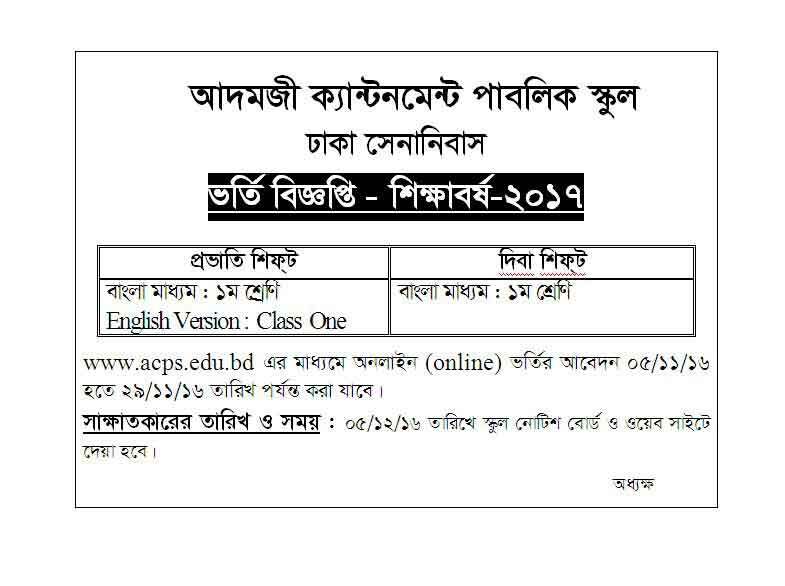 Adamjee Cantonment Public School Admission Notice 2017 – www.acps.edu.bd. Adamjee Cantonment Public School Class 1 Admission Circular 2017. Interested Candidates Can Apply Through www.acps.edu.bd. Adamjee Cantonment Public School Class one (1) Admission Lottery Result Will found here. Class 1 lottery result Will Publish School Notice Board and Also AllExamResultBD.com site. Get all kinds of Admission Circular of School Admission 2017 in Bangladesh. Application can Apply from 5 November 2016 to 29 November 2016. Application Process Will Complete by Online. Adamjee Cantonment School have Two Shift and Two Medium. Adamjee Cantonment Public School Have Morning Shift and Day shift Along with Two Version such as Bangla Medium and English Medium (Version). Adamjee Cantonment Public Schoo, Dhaka Senanibas, Dhaka All Admission Details Will Found here. Candidates have to Apply through online at official site www.acps.edu.bd. and Application form can avaialable from 05 November 2016 to 29 November 2016. Go To Below Link For Fill Up Application form. and Submit Application Form. Before Fill up Application Form Read Application guideline carefully and Proceed to Agree & continue. After Complete Online Application Form, Candidates have to Pay Application Form Fee Through Online available various method. Also, you Can pay Application Form via bkas and others mobile banking payment Service, but in this case you have to pay first, Then have to Apply. Class one Viva Date and Time Will be notify on 05 December 2016. Primary Selection list Will found official site and also (www.allexamresultbd.com) our site. When the Authority publish list, we update here. Adamjee cantonment public school admission lottery result will upload here. Finally, All Information regarding Class 1 Admission like class 1 Lottery result, viva date and others details Will found here.